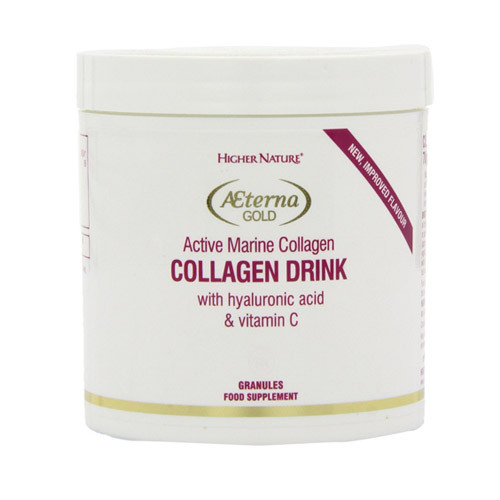 Higher Nature’s Aeterna Gold High Strength Collagen Drink features active marine collagen with Hyaluronic acid and vitamin C for increased absorption. Active Marine Collagen Drin contains pure marine collagen. Amongst other things, collagen is a key factor for supporting and maintaining healthy, flexible joints and youthful looking, wrinkle free skin. Active Marine Collagen Drink provides pure marine collagen, hydrolysed for easy absorption, as a nutritional support for joints. It can be added to juices for a pleasant thirst-quenching method to getting firmer looking skin. 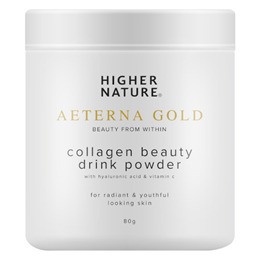 Aeterna Gold High Strength Collagen Drink also supplies Hyaluronic acid, which helps maintain moisture in the skin and vitamin C, which is important for the absorption of collagen. Hydrolysed marine collagen (from fish [catfish, pangasus catfish and tilapia]), calcium ascorbate, olive oil, sodium hyaluronate. Adults: Mix half a scoop to a smooth paste with a small amount of chilled water or juice, then add more water or juice, stirring all the time until dissolved (approximately one minute) before drinking. Take 30 minutes before or 2 hours after meals, or as your healthcare professional advises. ½ scoop = (4g approx) so product would last approx 20 days. Contents may settle during transit and scoop my sink to the bottom. Ensure lid is tight & store in a cool dry, steam free environment as damp conditions can affect product quality. Below are reviews of Active Marine - High Strength Collagen Drink - 80g by bodykind customers. If you have tried this product we'd love to hear what you think so please leave a review. Higher Natures Active Marine Collagen Drink features active marine collagen with Hyaluronic acid and vitamin C for increased absorption. Aeterna Gold may help support and maintain healthy, flexible joints and youthful looking skin.